Ask yourself this question: Do you think it would be possible to find a cure for a sick dog by experimenting on a healthy human baby? Absurd, yes? Just turn it around; vivisection is no less absurd! Animal experimentation is a disaster for animals and for humans. It is also a waste of our precious health dollars. Most doctors would agree that 80-90% of disease is preventable, yet we only spend 4% of our tax dollars on prevention. Scientifically, animal experimentation is unreliable because the numerous differences among species is not accounted for in test results. 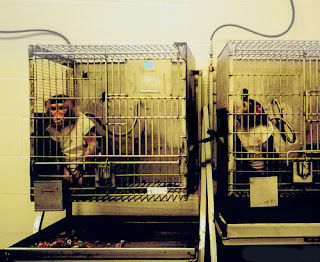 Animal experimentation serves as a vehicle for drug and chemical companies to market dangerous and toxic substances. Vivisection wastes billions of tax dollars and puts mega-profits into the hands of drug companies, taking away from our limited health dollars. What a waste! I stumbled on this blog and impressed with the people applying their critical thinking skills. I myself stayed up these last couple of nights caring for an aged horse.He has a brain tumor. Granted, there are some stupid researchers out there. I have seen some video that makes me want to puke. But quess what? Human babies are going to be chopped up in utero when late term abortion is approved. Stem cells!! #1 How many of you could prove anything "scientifically"? I see impressive verbage here, but the leaps in logic show that you all can't read the very papers you mention. #3Until humans learn to take all of their(expensive) antibiotic pills instead of buying the latest gadget,car or peircing...Our health system will become more strained with resistant bacteria. #4 Miles Novy did the actual research on almost all of his papers YEARS earlier. He is very wiley about not tipping his hand because the competition for funding is intense. He has to write proposals that are unique, feasable and utilizes the resources he has access to. Can any of you write a grant proposal that will be accepted by NIH? #5 The truly creative mind can see how one thing can be applied to another situation, then sets about proving it right or wrong. Everyday, we benefit from past theories. #6 Just because one scientist "proves"a "relationship",does not always show the "how". #7 If one researcher does prove a connection, IT MUST BE REPEATABLE IN OTHER LABS. Sometimes people will lie, make a mistake or not know that the microscopic fungus that lives in their vent contributed to their success! (If you think I am leapin'...Think about WHY systemic treatments for fungus are somewhat toxic to humans...COULD IT BE THE SIMILARITIES BETWEEN OUR CELL WALLS AND A LOWLY FUNGUS??? #8 I hate sweeping "health care" comments. Again, leaps in logic from some persons who never saw the abuse of our ERs or know how much an electric eel contributed to their test results. I regret to be so BLUNT but I have an old horse to comfort. Miles Novy is not the type of researcher you all need to worry about. Study some more, and if you all are real serious about waste in research, there are some real liars and wasters out there. I worked for a scientist who had 4 sets of new pipettors, but made her techs use the crappy innacurate set. She imported her post grads from India instead of hiring US citizens. I would not sacrifice one animal for her science.I quit after 3 weeks of that b.s. Yes, I am published in a scientific journal. I know Dr. Novy's work and the people who worked with him. Those tether suits are awesome! Every sample taken is treated like gold. The animals are familiar with humans. I have seen more horses, dogs and children mistreated than I EVER saw at ORPRC in the 11 YEARS that I worked there. Now I work in health care because it pays better. Should we not intubate people because it is invasive and distressing? Should we not give your loved one any drugs to help them beat/recover from illness...because they were all tested on animals first? OR...Should we just skip the testing and pump patients and pets with all kinds of stuff and hope for the best?